Welcome to your Real Estate Resource for Kirkland Luxury Homes and Seattle's Eastside! I am a 26 year veteran and second generation leader in the Real Estate Industry. You might say I have real estate running through my veins! I am an expert on homes for sale in Kirkland, Bellevue and Seattle. With a commitment to platinum level customer service and continuing education, my clients are elated to have me on their side at the negotiating table, especially in our highly competitive, fast paced market. I continually create relationships that last long after the transaction is closed and my clients become my friends. I am known for my work ethic and have earned many elite designations that make me stand out among my peers. I am a Certified Residential Specialist (CRS), Accredited Buyer Representative(ABR), Certified Negotiation Expert (CNE) and Accredited Luxury Home Specialist (ALHS). Additionally, I have worked in all segments of the market from first time home buyers to luxury new construction. My vast experience will be an asset to you no matter what your real estate goals may be. 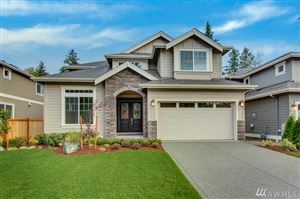 If you are looking for Kirkland Luxury Homes on Seattle's Eastside, contact me today! I look forward to serving you! Without a doubt the easiest process I've had in buying and selling my homes. Susan was a professional from the first moment we started talking about my goal to sell my condo and to buy a home in Seattle. It was clear she was very familiar with the market conditions and had already done homework on comps in the areas before she met with me. Susan's industry knowledge, selling strategies, and genuine interest in helping me achieve my goals made the very stressful experience of selling a condo in a down market seem enjoyable. Within one day of meeting Susan she had already taken pictures of my condo and had it listed the next. Once an offer was made she was right there to compare the offer and suggest any plan of action. We did actually reject the first offer base on her input and subsequently sold my home for more than I thought I would get. Susan has an amazing sense of humor and provided me all the answers to my questions almost as quickly as I asked them. I would highly recommend Susan for anyone who is looking to sell their home and find another in the area. I have worked with Susan twice since I was introduced to her. Susan assisted me in selling my condo in Bellevue. What impressed me most about Susan was her incredible energy and willingness to listen. She assisted me with all the details, finding and scheduling all the work that needed to be done to maximize the profit on my sale. What could have been an extremely stressful time was manageable due to Susan’s attention to detail. With the sale of my condo I moved out of the area. Later when I returned to the area and was ready to purchase a home, the first person I called was Susan. She was able to give my husband and me some great advice about where to look for a home. Again she listened to our long list of needs and found us the perfect home. Thanks to Susan it was another successful transaction. I think we’re staying put for a while but I will wholeheartedly refer Susan to anyone looking for a realtor. She really is the best! One of the best representatives I have had the pleasure of dealing with. She was very cooperative; exercised good follow through; is current with all the contemporary required information; made helpful suggestions; and even helped stage my home. Her communication was good, and timely. This is the fourth time I have used Susan to represent me. I highly recommend her. Susan's commitment to excellence is outstanding. I have used her for 3 separate property sales/purchases over the last 2 years. I have tried other agents in the past, however no one has come close to Susan's skill set. Susan is not only quick to respond, she has an extremely high attention to detail, and is an excellent negotiator. Whether you are new to buying homes, or a seasoned expert, Susan is an asset to your real estate experience. Susan makes you her top priority, working with you until you are completely satisfied with the entire process and the overall outcome. I recommend Susan to all of my friends and family, because I know that they will be in good hands. Susan helped me purchase my home in 2015. She was very knowledgeable and professional. She made the whole process a breeze. In a multiple offer situation with 11 other offers, her skill and experience secured the home I wanted. In my previous home buying transactions, I didn't have the confidence and comfort that Susan's abilities and skill gave me. She was completely top notch. I have already referred friends to Susan and will continue to do so.. Thank you Susan !! Very insightful. Susan is very patient and will not stop in finding your perfect home, and after sale is there congratulating and sharing in the home buying experience, making you feel at ease. Job well done. Susan will stop at nothing. Susan is there for you. No question is too silly. If you want to understand, Susan will help you understand house hunting, buying and selling! You are never alone in uncharted territory. Susan has been there, done that! Susan is this best! When it comes time to sell and buy... I am calling her!! She is Supergirl!!! Susan sold our home for us in July of 2015. . We found her to be highly professional and knowledgeable. She provided us with information about comparable home values in our neighborhood. We sold our house the first day we accepted offers, for full list price. She did an outstanding job for us!! Susan has a personal touch that leaves you feeling more like family than just 'a client'...We have had the opportunity to experience her thorough knowledge of all aspects of the industry, as well as her intuition of market trends. We recommend and refer her to all our family and friends. Map based search at the touch of a finger. Pin point accuracy, up to date information and more. Search for property types with ease and see inside your dream home with full screen photos and property details. The app allows you to connect with me so I can provide you with great service in a shorter amount of time. Need a Contractor, Plumber, Electrician or Kindle? Shop here!